So luckily the seas calmed down this afternoon – and we certainly were rewarded! 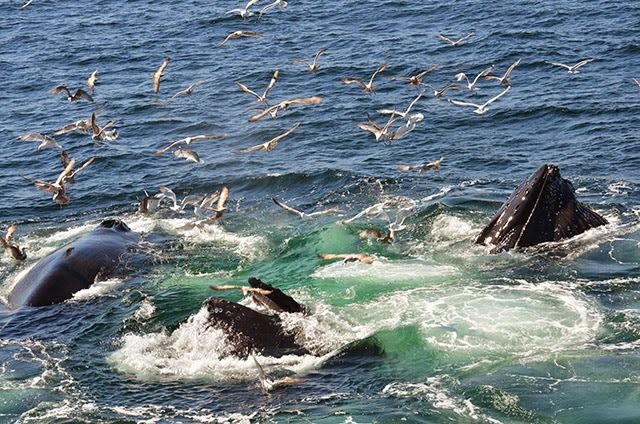 We traveled to the SW corner of Stellwagen to find 20-25 humpback whales scattered in groups bubble net feeding and kick feeding (which includes 4 mom-calf pairs), 4-6 fin whales, 1 minke whale, and a HUGE amount of gull activity! 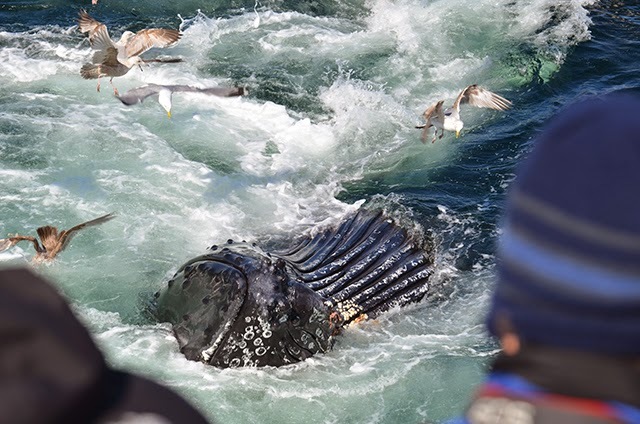 If you're a humpback whale, the food is bountiful this time of year! We started out getting looks of two traveling fin whales, and then found Nile and calf! It’s been great to see the most photographed whale of 2013 finally with her calf in tow, and the pair treated us to a nice look crossing our bow. We left Nile and calf as Milkweed and her calf began approaching them to move on to the feeding frenzy in the distance. 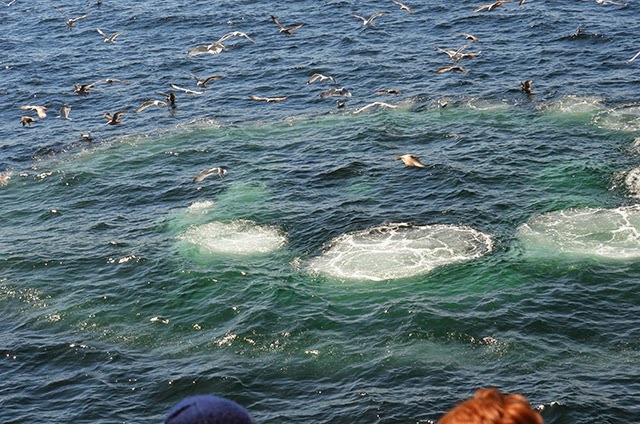 At any given time, there were about 2 to 3 spiral bubble nets scattered about, with tons of gulls swarming to each net, and also scattered kick-feeding humpbacks. 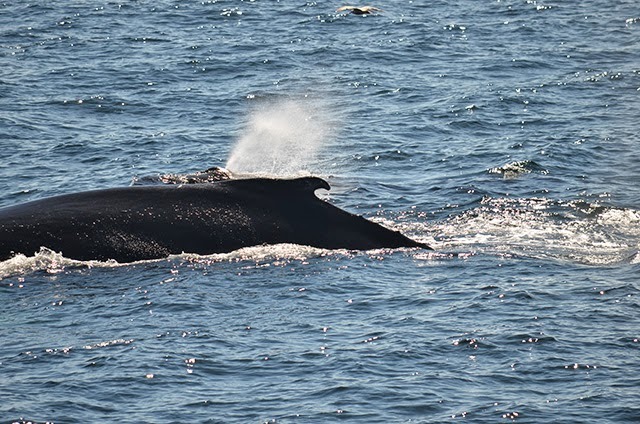 A few fin whales were traveling amongst the humpbacks. We ended up on a group of 5 humpbacks – Vulture and calf, Yoo Hoo (who followed closely alongside Vulture), Daffodil, and Grackle. These five repeatedly gave us amazing looks of large spiral nets, where Vulture would always come up first. We had to put our boat out of gear because they kept feeding closer to us – and at one point the group made a net right next to us! 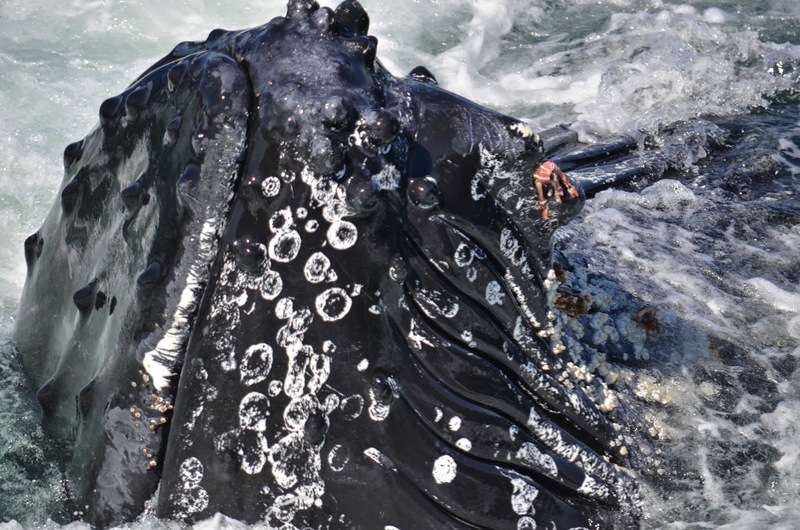 We were treated to a spectacular look as the group open-mouth alongside us – my favorite shot of the day is an up-close look of the barnacles & stovebolts on one of the whale’s chin as it came up feeding – I had to zoom out to get a shot of its ventral grooves. 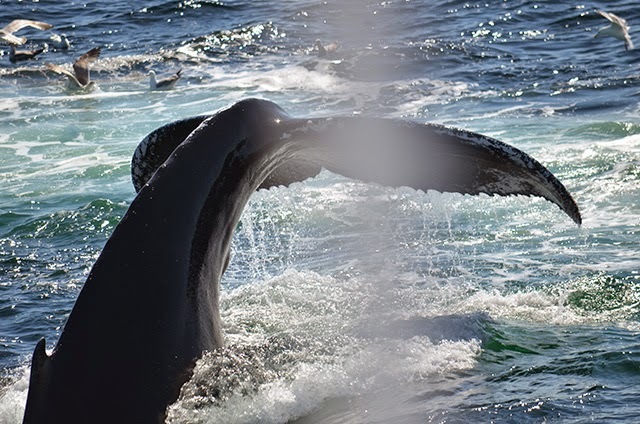 Just as we thought it couldn’t get any better, Glo-Stick and calf came by us to kick feed, and several other humpbacks were surrounding us feeding. Vulture’s calf also got very curious to the boat – swimming under our pulpits for several minutes!! We wrapped up the trip surrounding by 10 to15 humpbacks bubble and kick feeding in every direction —another spectacular day!